I’m just waiting for pictures to come up so keep checking back here and I’ll post as items come up. I saw the 100% Merino Wool Sweater for $108 today called the Run: Balance Base Layer (pictured horribly below) a grey Heart Tank with Splatter print pattern on the bust (cute), 2 new winter run pants (one was a fleece lined tight! ), Push Your Limits in Persimmon, and one in Very Violet. New Yogini Dance Tank in all colors (luon light body). 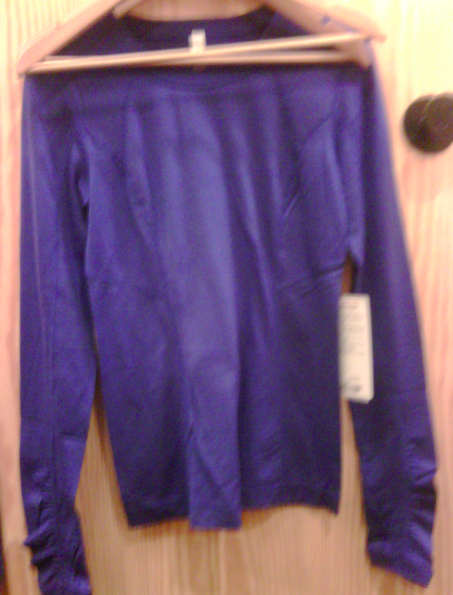 I saw a new Heathered Haze Live Simply Tee (cute) and a new Sweater called the Live Simply Sweater (wish blue), looks very similar to the Wear With All except not as fitted. "Alpine Pullover is Here!!! And Cuddle Ups"